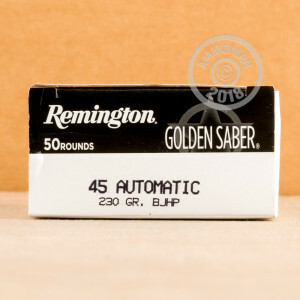 Take note of any ammunition that has been approved for duty by numerous law enforcement agencies -- they do their research, and it’s an understatement to say that cops don’t like being prepared for the worst. 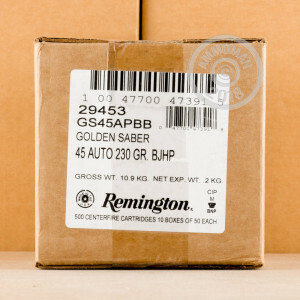 This 45 ACP Golden Saber round from Remington features a 230 grain projectile, the brass jacket of which is harder than the more frequently used copper gilding metal. This lets it penetrate common barriers more reliably, and also release greater energy over long distances. This bullet’s wide hollow cavity and the spiral cuts in its tip let produce a very large wound cavity, even at lower velocities, and helps to prevent the kind of overpenetration that could jeopardize innocent bystanders. 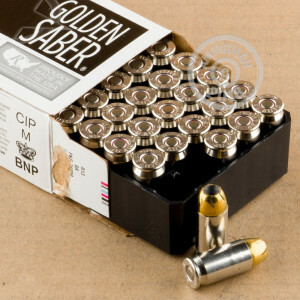 Seeing as how cops often have to go in dark places, this round is optimized for use in them. Its propellant is formulated to emit a duller flash, so your first shot in the dark won’t blind you. This means you’ll still be able to see for accurate follow-up shots, or even to acquire a second target if the situation calls for it. This round’s casing’s bright nickel plating also makes it more easily spotted during a chamber check.